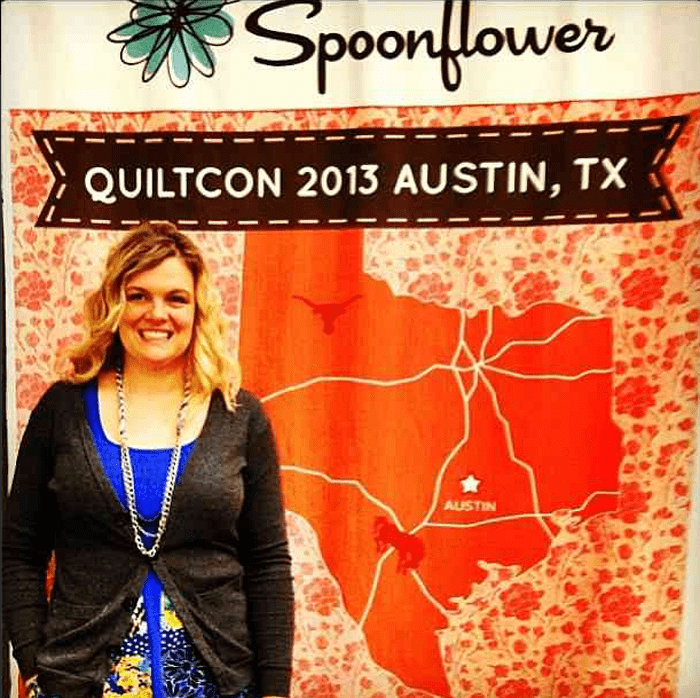 Last weekend my lovely sister-in-law Nico and I road-tripped down to Austin for a day at QUILTCON, presented by the Modern Quilt Guild. Yes, we left 5 children under 6 with the men and hit the Texas highway with fried pies in hand. Note: when the girl behind the fried pie counter insists that you take a plate and fork for your pie, listen, or you’ll end up a couple of Yankees trying to eat boiling hot juicy blackberry fried pies like candy bars. Serves you right, amateurs. 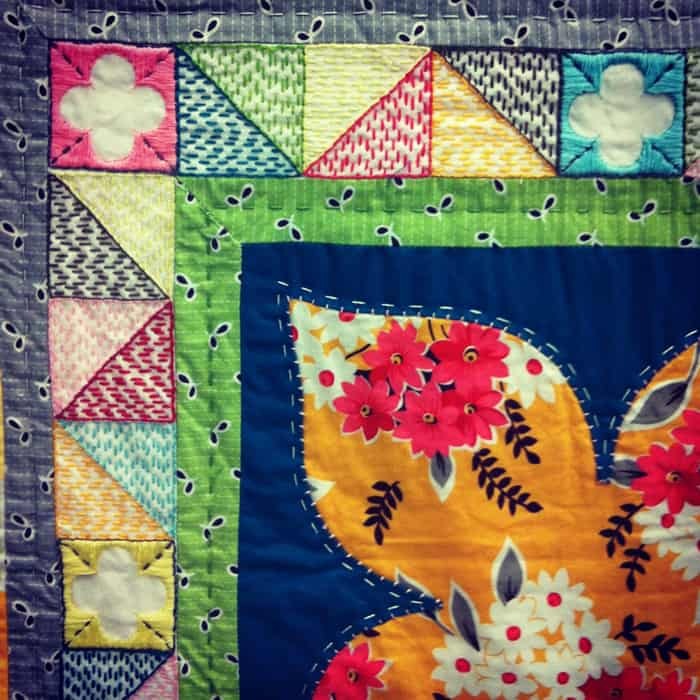 So QUILTCON, yes! So fun. We started the day with a lecture by Mary Fons. Are y’all familiar with her empire? Well she is incredible. Extremely entertaining (see slide below), passionate and talented. I’m a new fan. Then we hit the floor. 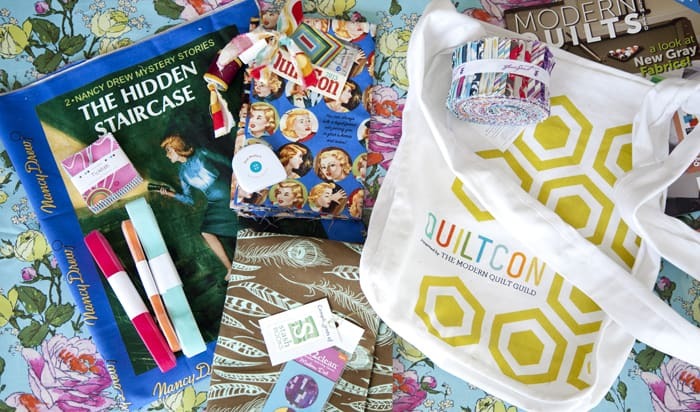 We had received an drool-worthy SWAG bag filled with quilting goodies (yes, fabric too! Amazing) but of course we had to shop as well. Here is my loot, purchased and gifted. 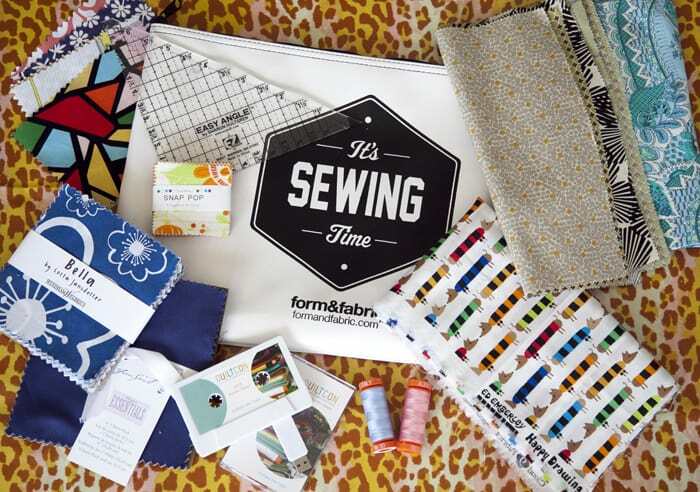 Highlights include the hilarious sewing bags from form & fabric (here they are for the not-easily offended,) velvet ribbon, hard-to-find fabrics from Stitch Lab in Austin and a charm pack that I bought from Lotta Jansdotter. Actually from her. 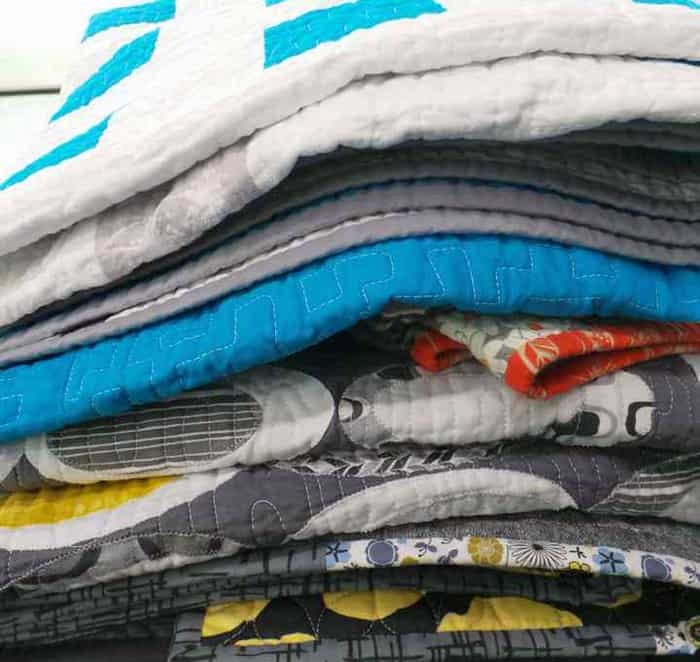 She was selling her own fabric in a ‘lil booth. Awesome. That little cassette tape above? 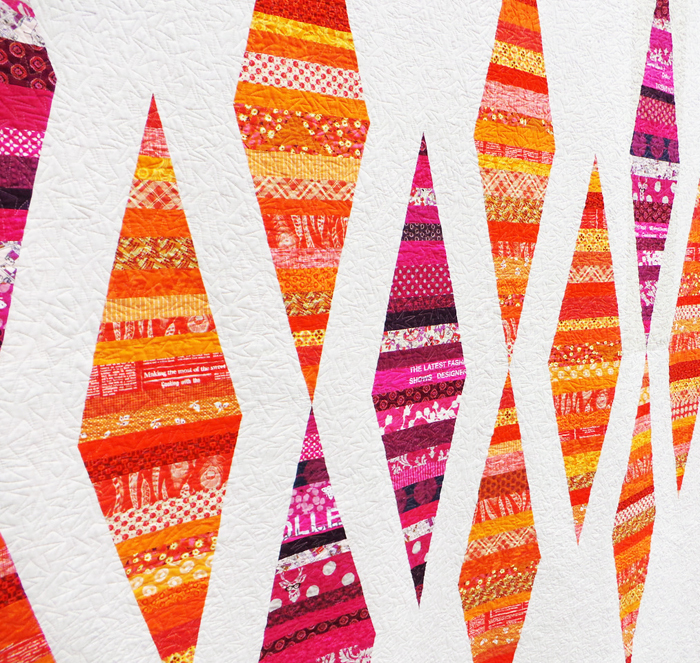 It’s a USB drive filled with quilt patterns from the modern quilting superstars. So clever for their 80’s theme! 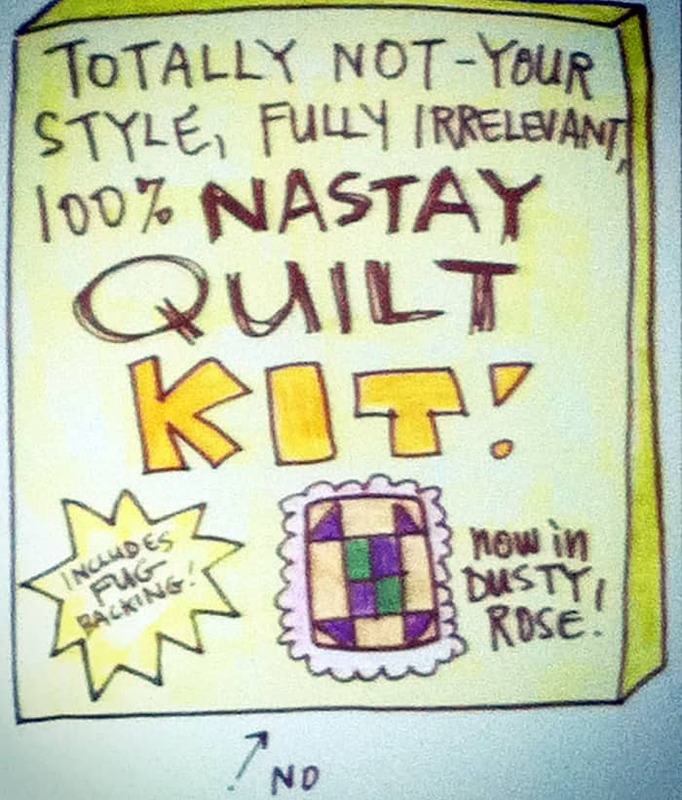 Are you seething with jealousy over my Nancy Drew fabric? YAY STUFF! 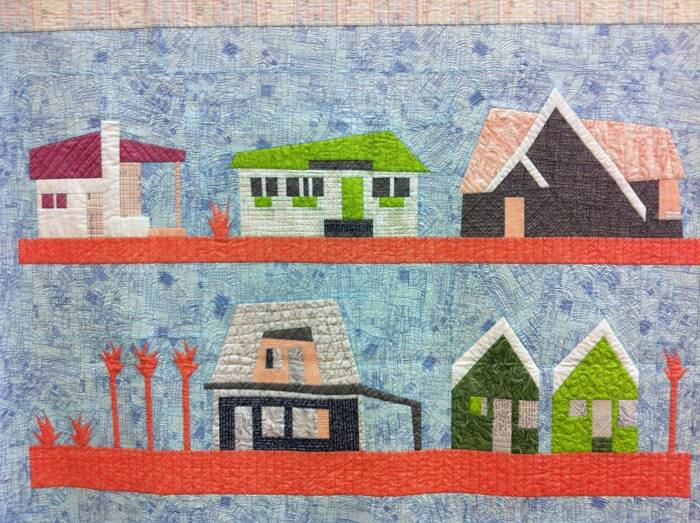 The hand-quilting on this one was impressive. 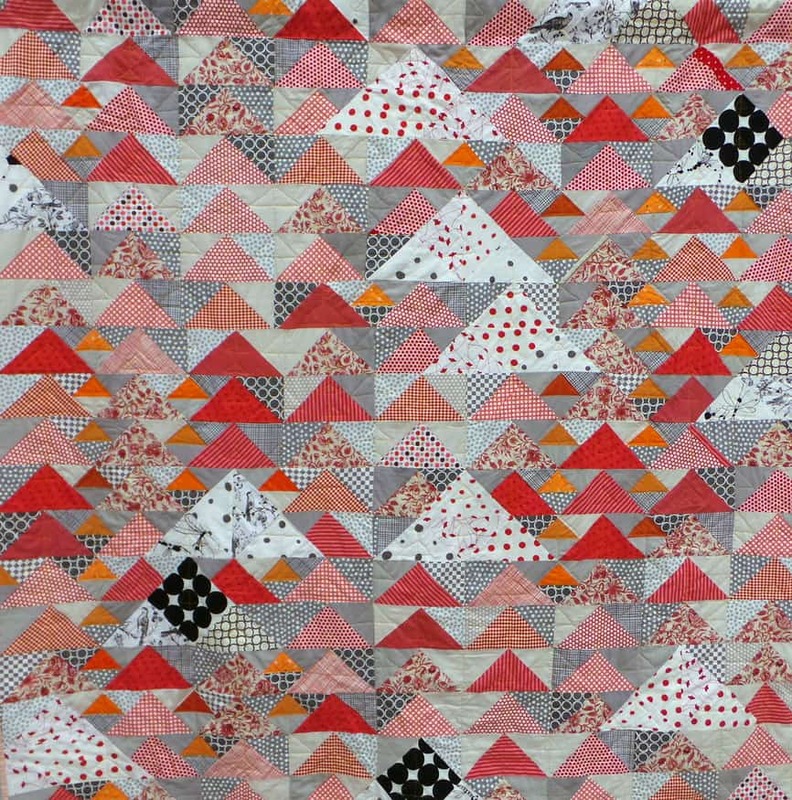 I loved this enormous triangle beauty by Jessica PierreAuguste. There’s a good chance my dress is actually a nightgown. If y0u know, don’t tell me. 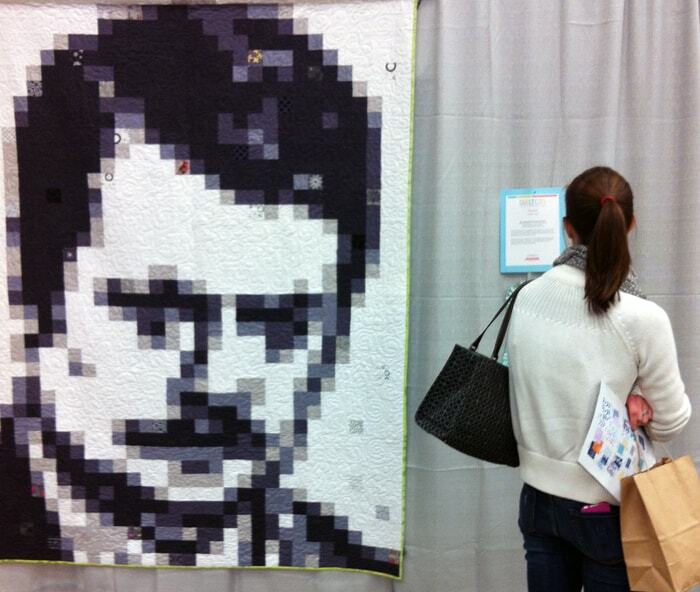 And if you saw any posts from QUILTCON, you saw this Ron Swanson quilt, but it could not be excluded from any proper QUILTCON report. 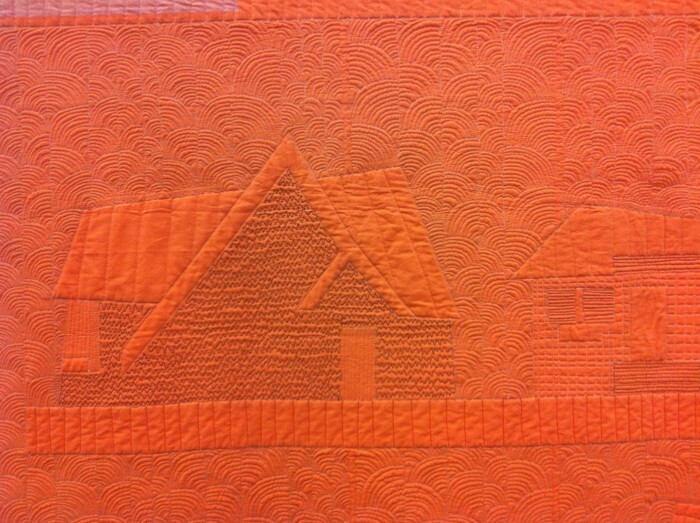 Then we peeked in on a few of the workshops by the likes of Anna Maria Horner, Elizabeth Hartman and Jay McCarroll. 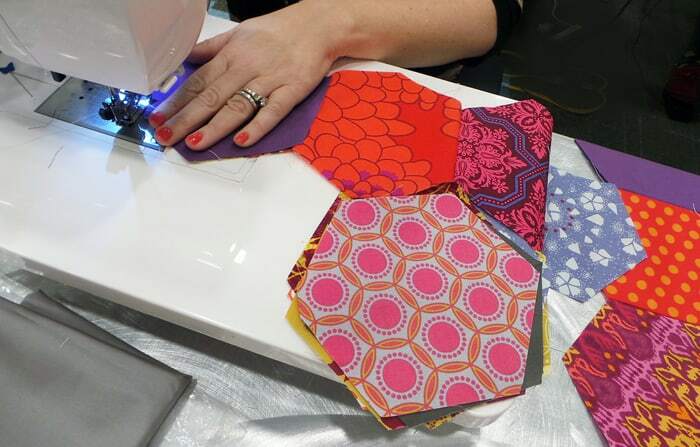 The attendants were in heaven learning new skills from their favorite quilt world celebrities. 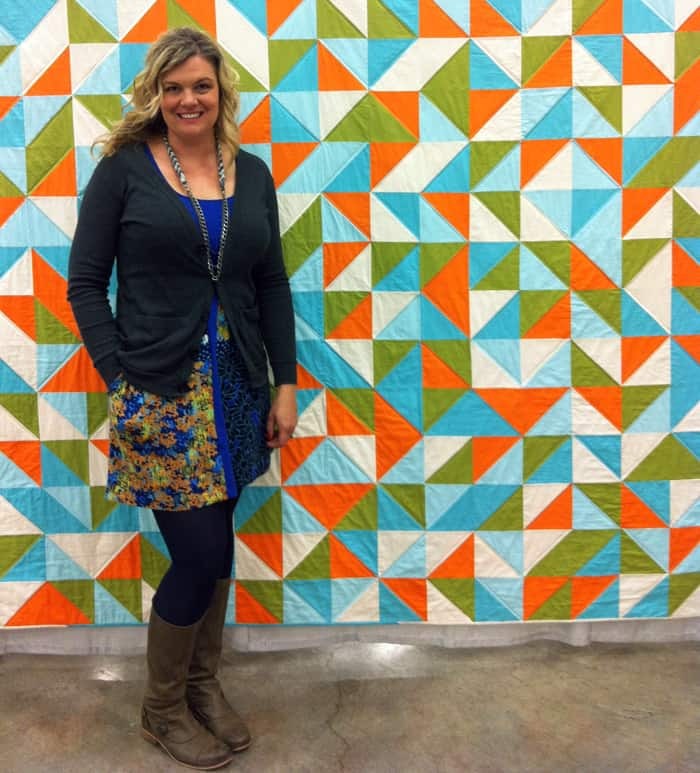 Of course, the highlight of my day was meeting the gang at Spoonflower and seeing my fabric designs used in this amazing Texas backdrop! 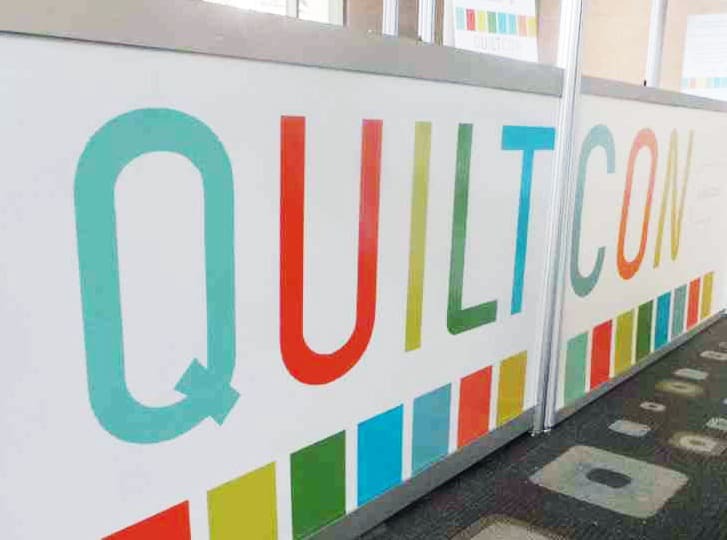 If you are obsessed with attending the next QUILTCON, it will be in 2015. Stay tuned to find out the details! Wow! 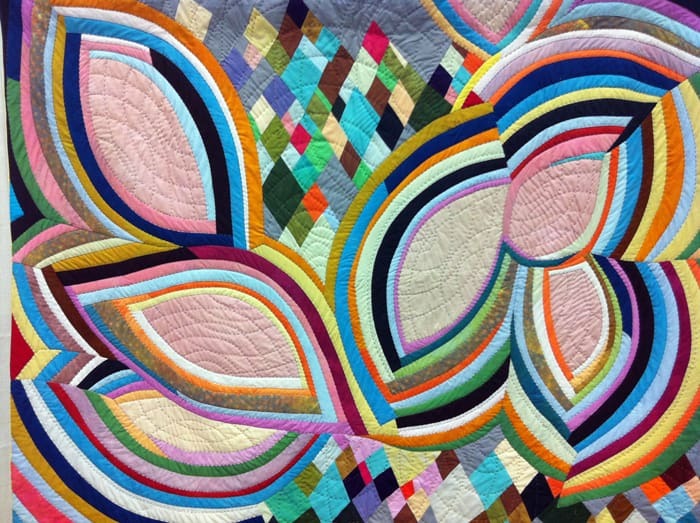 I envy you the trip to see so many beautiful, inspiring quilts. Although I’m enjoying all of the virtual visits. This reminds me that the internet is amazing! What a talented and busy lady you are! I love all your posts- you must be exhausted!! While today’s set ” up ” is striking – that shelf regarding items as a result of Apple past is actually interesting.